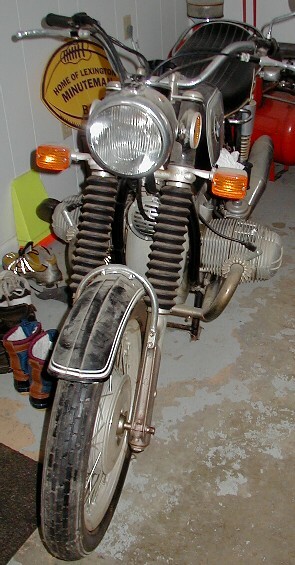 (Dec, 2005) I'm restoring a 1973 BMW R 75/5 (LWB)motorcycle. It sat in a basement since 1985 and was not started. The basement was heated and airconditioned, so it accumulated very little rust that I can see. The primary affects of time are a collection of dust (you can see that in the picture here) and a fuel system that leaks like crazy. The hoses are shrunk and rock hard, the petcocks leak profusely (or started to leak as soon as we touched the bike). I imagine that I'll find that the carbs are gooked up too. Hopefully the diaphragms and gaskets in the carbs won't be ruined, but I imagine there's a good likelihood of it. According to the serial number (4005xxx) and factory records, the bike was built in May, 1973 (and indeed the lable on the steering column frame tube says Date of manufacture 5/73). The bike has only 3490 miles on it, so even the tires are the original we believe (Metzler brand). I don't own this bike, I just have the privledge (and fun) of working on it. Here's the payoff of having the bike back on the road. See some pics of the finished project. To see what I ride (and work on a little bit) see 2000 V-Star 1100.